How will the U.S. military stay competitive? This is about far more than platforms, bombs, and guns. It is fundamentally about people. And with archaic personnel systems plaguing the armed forces and the Department of Defense, our talented young men and women are being drawn away into the private sector in Silicon Valley and on Wall Street. 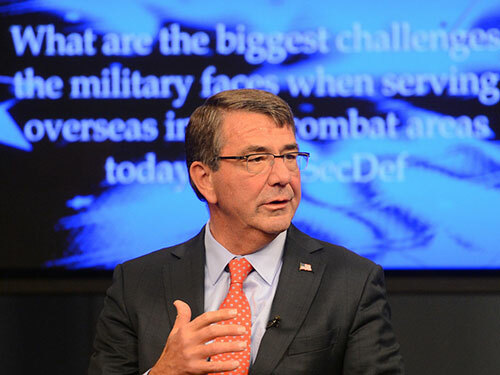 Secretary of Defense Ash Carter sat down with WOTR’s Ryan Evans to talk about the Force of the Future initiative – a sweeping program of reforms that aims to bring the Department of Defense into the 21st Century in terms of how it manages its most important asset: human beings. Listen to the podacst of this interview here. EDITOR-IN-CHIEF RYAN EVANS: Welcome a very special edition of the War on the Rocks podcast series, with Secretary of Defense Ashton Carter. Thanks for making the time for us, Mr. Secretary. SECRETARY OF DEFENSE ASH CARTER: Ryan, thanks for being here. Welcome to the Pentagon. EVANS: We’re here to talk about Force of the Future. It’s a program of reforms, aimed at changing the way the Department of Defense handles its human capital. And you have just announced the first sort of tranche for these reforms earlier this afternoon. Personnel reforms are not generally considered the sort of sexiest topic out there, when you look at Defense, particularly when you’re competing with attention in terms of issues with the Islamic State, Russia, what just happened in France. Why should the American people care about what you’re trying to do with Force of the Future? SEC. CARTER: Well, they care about having, in the future, as they have now, the finest fighting force the world has ever known. That’s what protecting them tonight; that’s what’s fighting ISIL; that’s what is keeping the peace and making a better world for our children everywhere in the world. Now, we have, today, the best. In addition to using that wisely, as we do, we need to make sure that ten years, 20 years from now, since we don’t know what the future will hold, that we have the very best men, also. That means attracting the people who are young people today to be part of our future. So, my job, as secretary of Defense, on behalf of our people is to — both to deal with today’s crisis and to leave behind me, to my successor and my successor’s successor as fine a fighting force as it is my privilege to lead. And we’re good for lots of reasons. We’re good because we have great technology, we’re good because we stand for great values, we’re good because we have lots of friends around the world, because people like working with Americans. But the chief reason we’re the best is because we have the best people. Now, you say this is kind of an abstract thing; maybe it is to most Americans, but I don’t want them to think that way. I want them to think that — as many Americans, in fact, do — how can I make a contribution? Many of them saw what happened in Paris over the weekend, and I was talking to a group of college students today, and I hope they’re asking themselves, how can I contribute to making a better world? Some of them will join the military, but that’s not the only way they can contribute. They could join DOD in other ways. And — but I want to create as many different avenues as I can, to make sure that the talented people who are part of our future join our force. And the last thing is, Ryan, I mean, it may be abstract in some way to the general citizen, but for our millions of people — military, civilian, and by the way, contractors who do a lot of our work as well — that’s what they do in life. And they want to — I need to make sure that they continue to improve themselves, keep up with the latest technology, get advanced degrees. That they have opportunities to take care of their families, to have children if they want to have children. And that — to the extent I can, consistent with military needs and with the profession of arms, and the ethos that we represent — consistent with that, to the extent that I can make it possible for them to live the lives they want to lead, and still serve our country. I want to do that. EVANS: And one of the heartbreaking things for me, as a longtime observer of the military, and someone who used to work as a civilian for the Department of Defense is seeing all these really talented captains and majors that just have so much to offer get out, because they feel they aren’t able to pursue the types of career paths where they think they have the most to offer. And I’m sure you saw that article in The Atlantic, not that long ago, by General Barno and Nora Bensahel about this, that featured Tyler Jost and Katey van Dam from the Army and Marine Corps. What — what are these reforms going to mean for people like that, that are still in, that are thinking about getting out in the next 14 months or so that this administration has left? SEC. CARTER: Well, we want to hold on to the very best if we can. And I go around to bases all the time, and I talk to people. Exactly that, captains and majors, and say, what is going on in your mind now? You’re going home and you’re talking to your spouse, or you’re talking to your parents — what is the conversation like? What is causing you to stop? And I try to do that as much as I can, but still, whatever I get is anecdotal in the end. One of the things — and there are lots of different factors — and where it’s something we can fix and address, and it’s — and are not addressing, and it’s causing good people to leave, I want to change that. Sometimes that’s their health care situation, their geography, whether they want — they have an educational opportunity, whether their spouse has a work opportunity somewhere near where they’re deployed, how long they have been deployed. I can’t control everything, but I can control some of those variables. But I — even more fundamentally than making those changes, the Force of the Future involves — one of the things we’re doing is using big data to allow us to actually understand the answer to that question. It might surprise you to know that we don’t collect data on why people leave us. Now, most businesses do, and they collect data on all kinds of people and their behaviors, and of course, companies are collecting data on your every click, right? What makes you tick, what makes you — why are we asking — why aren’t we learning in the same way, using modern data analytics techniques, what is making our good people leave, so we can stop it. So, it begins with information, and then we’re changing things. I’ll give you another example of things that change once we have an insight. One of the things we know matter to our young people is the opportunity to have — to get an advanced degree, because they think one day, they’ll be a veteran, and they’re going to want to keep working, perhaps after they retire, and they want to have some opportunity to do that. And they want to better themselves in the course of their military life. That’s good for us, because it gets them to stay. It’s good for us, because it makes them better while they’re with us, because of more advanced training. But too often, the way we run our system penalizes people who seeks higher degrees, rather than making it a commendable and rewarding thing to do. So, there’s a lot we can do to better — attract people, retain people in uniform, and also, as I said earlier, get people who can come in just for a short time. Not everybody is going to want to make a career of it, not everybody is going to want to make ten years of it. Maybe they — they want to come in for a year, they want to work on one project, they want to give it a try. It was a project about where to base — how do put an ICBM, a long-range nuclear missiles, the height of the Cold War, some place where the Soviet Union couldn’t attack it. EVANS: So, an important question. SEC. CARTER: It was an important question. And I — and I learned in the course of working on that, I said, wow, this pretty neat for a kid who is in his early 20s. I’m using what I know and it’s really valuable. I’m making a contribution. And if I weren’t in the room, that — that knowledge that I have wouldn’t be part of this decision. So, I was able to combine what I could do with what I thought was pretty darn important, and that hooked me. I want to hook lots of people like that, and I have got catch them at a time, and I’ve got to make it something that can try. I was given an opportunity to try it; I tried it, it caught me. But if I had never had a chance to learn, I would — I wouldn’t be where I am today. SEC. CARTER: On-ramps that gives people a chance to try their national defense road, see if they like it, maybe they’ll stay on it. And also off-ramps, so that people who are in service have an opportunity to go out for a while, get business experience, be in a company, a forward-looking company, or one of our best company, and apply what they learned there, their best business practices, their best I.T. practices, their best personnel practices, their best global awareness practices, the best big data practices, to what we do, which is protect people. EVANS: What about — are you — how hard are you looking at the up and out performance promotion system? SEC. CARTER: We are looking at that. I did not announce decisions on that today, for the very simple reason that that’s complicated, and we’re still trying to work out what the best approach there is. We know we can improve the way we operate, which has its — has real strengths, so we don’t want to throw out the baby with that bath water, so to speak. But we want to improve it, and so we’re — we’re working on that with our senior uniformed leadership, who, of course, know the force best and know that system best. And so, they’re the ones who were — who have — who are best positioned to think that problem through. And when we finish thinking it through and think we have a solution, then I’ll be announcing that one. EVANS: Okay. And in your speech, I noticed you mentioned a lot of — a lot of companies that are very familiar to most Americans, Facebook, LinkedIn, Netflix, Twitter. What lessons from the private sector do you think are applicable to a war fighting organization, and which do you think are not? SEC. CARTER: Well, not all, because, you know, we aren’t a business. We’re the Department of Defense; it will always be different. But that doesn’t mean we can’t learn from them how they manage technology. We can’t learn technology itself from them. We can’t learn human resources or personnel management techniques. We can’t learn from them how they deal with family issues, as they apply to their employees. There’s a lot we can learn from best practices in industry. And by the way, we can learn not just from companies that everybody has hear about, whose name everybody knows, but a lot of — also from what makes America particularly innovative, which is the companies you and I haven’t heard of yet, but will in two, or five or ten years. That’s a distinctive American genius, which is to start new things. And we want to harness that innovative potential for Defense, because that’s what brought you stealth, that’s what brought you the global positioning system, that’s what brought you, by the way, the Internet. Originally it was a defense thing. That’s what brought you satellites and jet engines in the old days. EVANS: Well, and since you’re — since you’re competing with these companies, like the big tech companies that we just mentioned, what non-monetary incentives are you willing to offer for people that have these specialized skills like engineers? SEC. CARTER: Well, that’s a very good question. Well, the answer is captured in that exact quote. I’m never going to be able to pay people what they can get out in the private sector. Their reward is to be part of something that matters a lot more than getting people to click on something or take pictures of themselves. They get to be part of the most consequential and also honorable thing you can do, which is protect the society in which you live and hand over a better world to the future. That’s what captures them. So when I get even people who are very experienced, who are getting paid an awful lot of money. And when we get the chance to familiarize them with the problem, they find our problems fascinating, but they also find them very meaningful and they want to go home and tell their spouse, or tell their parents or tell their kids that that’s what they’ve been doing all day. And that really matters. People want to live lives that are meaningful. Our most innovative people are people who want to make a difference. And this is another way that they can make a difference. So, our mission is magnetic for the very kinds of people we want who are people who want to make a difference. EVANS: My friend Kimberly Jackson, who actually used to work in this building asked a very good question. She said, what does the U.S. military look like in 20 years without these kinds of reforms, looking at the threat landscape and what Russia and China and other adversaries are doing? What are the — what’s the cost 20 years down the line of just doing business as usual for the U.S. military and the Department of Defense? SEC. CARTER: Whatever lies down that road 20 years from now and we — and one of the things that we’ve never been good at is deciding, is figuring, is predicting what we’re going to — what fights we’re going to be in 10 years to 20 years from now. And so, what we need 10 years to 20 years from now is an agile, innovative bunch of people who can figure it out. And that’s what we had in Iraq, in Afghanistan where people — they even COIN, counterinsurgency that is, there wasn’t a — that was a new form of warfare mastered by and executed by a brilliant, brilliant generation of military officers and by the way, other people around the government also. Cause it’s — we know most conflicts today have a defense and a non-defense ingredient to them. I would claim and I’m with moral certainty that no other society could have mustered the ingenuity that the American society did to fight those fights on. I recognize that in some quarters, those words were controversial and not everybody — but that’s not what I’m talking about. SEC. CARTER: — and the — it was brilliant. And that wouldn’t have even been possible without the first class people. So I need to leave to my successor and my successor’s successor first class people. Cause I can’t predict the strategic future. But I do know that if I leave them the best people, they’ll figure it out and succeed and protect America. SEC. CARTER: It’s a mix. It’s a mix. A lot of it we can do ourselves. SEC. CARTER: Oh. We can apply those big data techniques. We can change the regulations that allow people to go out and get — go to school. When it comes to really big things, like one of the things that we have been working on is retirement as you know. That — some of those rules are written in law. So we have to go to the Congress and get them to be partners in this enterprise. And the most far-thinking and reformed minded members there know too that our secret sauce is our people and our secret sauce is the ingenuity of our people and that even as they fund us to build a new bomber and they fund us to build super-secret things, they need to fund the people of the future as well. EVANS: And, you know, one of the — I think this is a very historically important issue. As I was preparing for this and reading about these issues and you know, we’ve published a lot on this. But I also look back in history and you know, we remember Gaius Marius, the Roman statesman, 100 years, about a 100 B.C., implemented these massive personnel reforms across the legion that brought in all of these kinds of people from Roman society into the military that hadn’t been there before. And a lot of historians agree that this lengthened the, strengthened the power of the Roman legions and lengthened the life of that entity, the Roman Republic then the Roman Empire, so I think that this is really important. But these need to be seen through beyond the next 14 months and so what are you looking at doing to make sure that your successor, whoever this is, you’re sort of able to hand the ball off and make sure that they keep running down the field? SEC. CARTER: Well, as much as possible. I’m a man in a hurry and I will try to figure this out, work with our leadership and put us on the — a course so that my successor has things, as many things tidied away as possible and is on a good path as possible. And it’s — people ask me this Ryan, all they time. They say, well, you’re going to be secretary of defense now for another what, 14 or 16 months it’ll be like. And the administration is going to end in 16 months. What can you do in 16 months? And I have two answers to that. One is, that is a very Washington question, because in the rest of the world, 16 months is a long time. In the tech world, it’s forever. And so, I can go on in 16 months and we can do a lot in 16 months. And secondly, I may not be able to finish everything I start in the next 16 months but man can I start a lot. And so, we’re going to make the best use of it and start a lot. And then I’ll leave it to my successors to solve other problems which I’m sure will come along, but leave them in the best possible situation. SEC. CARTER: Me too. The — what I want them to know is we want you to give a second look. We want to keep you. We want to keep our best people. And I know I can’t just beg you and I can’t just, you know, ask you out of the goodness of your heart. We have to make it work for you and I’m determined that we do that as we go forward. EVANS: Thank you very much. Ryan Evans is a widely published commentator and recovering academic. He deployed to Helmand Province, Afghanistan from 2010 – 2011 as a Social Scientist on a U.S. Army Human Terrain Team that was OPCON/TACON to the British-led Task Force Helmand.